We recently covered the announcement of GetSocial 3.0 and its integration in Ruzzle Adventures and MMX Racing. Since then, we've had the chance to look into how the tech behaves as well as to chat up the team over at GetSocial, focusing on what it can do for mobile games developers or publishers. Sharing, invites and gifting to friends across social media is critically important both from a User Acquisition (UA) perspective (this, along with app store optimization, is what ultimately helps many a mobile game publisher bring the effective cost per install (CPI) levels under lifetime value projections), but also for user retention, cross-promotion and community-building. Thorough social media integration has thus become a critical component of any successful or ambitious free-to-play game. The social media landscape today is much more fragmented than it once used to be, especially if you consider chat messaging apps and networks that are popular only in one particular region of the globe. Implementing them thoroughly and leveraging it all intelligently is not by any means a small feat. Really nailing down the UX in social is technically much more advanced than most would think. Furthermore, it's a quite different type of programming than game development. Engineers who specialize in this field traditionally boast different experience and skillsets. The biggest publishers can staff up and hire an engineering team that is dedicated to such marketing-related integrations. But even for them, it has become hard to keep up. For smaller and medium-size development studios, social media is probably the most affordable way to gain a bit of visibility, yet doing it right has become a huge unbearable overhead. The ecosystem needs startups that dedicate to building state-of-the-art social layers which developers and publishers can integrate at will, subsidizing the cost of research and development and recouping the initial investment from the immense pool of developers that are active on the market. If done right, this model would prove ultimately cheaper for each developer than if they were to build and develop their own (oftentimes sub-par) systems. Multiple companies have before tried to solve the "mobile gamers social network" equation for everyone. So far, attempts have either failed to scale or collapsed when trying to monetize their reach. One prime example of this is the fall of OpenFeint post-acquisition by GREE in 2012. The GetSocial crew has analyzed, observed and ultimately learned from their predecessors' mistakes. Reinout Te Brake and Adam Palmer, respectively CEO and CPO of GetSocial, always put a great emphasis on two words when pitching their system: "unbundled" and "co-exist". Rather than trying to be the all-in-one solution that takes over the entire social media integration of a game, GetSocial is in fact a buffet of APIs and social plug-ins which you can pick and choose depending on your exact needs. The extra bells and whistles can be added around your existing structure and "co-exist" seamlessly. In case there's any conflict with your set-up and their stuff, the GetSocial team is there to help out with custom integrations. "If you are a newcomer and want GetSocial to be your complete social media solution, we can do that," says Te Brake. We have 27 people working on this day in, day out, most of them engineers. "But in most cases, developers already have deep integration with Facebook or Twitter, and they of course don't want to remove what they built - we're totally cool with that!" Furthermore, the bits and pieces that you take from GetSocial are white-label in the sense that they can be fully adapted to your UI, visually-speaking. This is a crucial strategic point. No big publisher in its right mind would be ready to outsource its entire social infrastructure to any external company, no matter how good that company may be. Furthermore, Facebook integration is already so thorough in some games that it has required a huge amount of man-hours to get it there. Removing it for something else would require a whole lot of development work again, which would be counter-productive. GetSocial focuses instead on the sophisticated and the complex, the stuff that even big publishers don't necessarily have the bandwidth to deal with. "Really nailing down the UX in social is technically much more advanced than most would think," stresses Te Brake. "We're not a team of 4 or 5 here - we have 27 people working on this day in, day out, most of them engineers, all of them with game industry experience"
The most innovative and intriguing offering of GetSocial is certainly its Smart Invite component. Unsurprisingly, it is also the most in-demand item, with a lot of publishers either working on its integration or calling in for info. If you've already performed any integration of the Facebook Social Graph, or of Kakao Talk or LINE, you know how invites work. 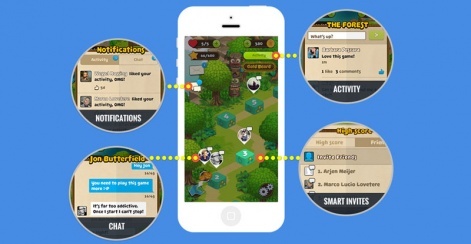 Existing user can invite his social friends to play the game with him, boosting your organic installs in the process. Smart Invite enables the same process but is totally platform-agnostic. This means that any user can invite friends from all his different social media accounts, rather than just one. At the time of writing, GetSocial supports not only Facebook, SMS, email or Twitter, but also hot chat messaging apps like WhatsApp, Kik, Kakao Talk and LINE, and the highly engaged Instagram. Both the business developers and engineers are hard at work to further expand the list, with support for SnapChat supposed to roll out early July, according to Adam Palmer. "70% of invites are triggered to other networks than Facebook," he reveals. 70% of invites are triggered to other networks than Facebook. "More importantly, the conversion rate of Facebook invites we witness is around 3 to 5%, while the median average conversion rate of our top 3 networks by performance (WhatsApp, Kakao and Kik) comes at a staggering 45%." To avoid clutter and chaos, the Smart Invite system runs a scan of the user device to find out which apps are already installed on it. Only the social networks that you actually have will show up in the menu of options. The output link takes the person who taps on it to the appropriate App Store (Apple or Google Play) depending on his device type (iOS or Android). At developer's discretion, it is possible to enable promotions that users can extend to their friends. You can for example set up a campaign that for a limited time enables users to share a smart-link that gifts extra virtual currency or free items (relying on your existing IAP grid) to the friends that they invite. The promo is baked in the link and user redeems it at first-boot if he installs through the shared link. Developer can also reward users that invite their friends for the installs they generate, turning their biggest fans into incentivized "ambassadors" so to speak. GetSocial stores the lists of users acquired through Smart Invites for its clients, so that you can then send them notifications about promos, updates and new releases. Naturally, developer retains ownership and exclusive usage of these lists. These promos can be tied to a particular level or in-game moment, and logged in users can engage with them by liking and commenting. The activity log is shared under the promo post, which makes the promos psychologically more appealing. "This boosts in-game revenue immediately and significantly, as we have seen with our initial tests in MMX Racing," claims Palmer. Developer can also sift through the social activity data to fine-tune these promos, and also to identify most socially engaged users. Apart from the Smart Invites, GetSocial also offers a chat solution that works cross-app, meaning your players could chat seamlessly across your entire portfolio of titles. Gifting among friends is next on the roadmap. When it comes to social organics, economics are a sensitive issue. The whole point of social organics is that they are free. Increasing the k-factor (= virality ratio) is sure welcome but not at any cost, and certainly not at CPI prices that come any close to those observed in performance UA channels, as this would defeat the purpose of the activity. GetSocial is fully aware of this and has come up with a smart pricing model for its Smart Invites. The basics is that for every user who installs the app thanks to Smart Invites, GetSocial charges developer $0.25, except for anything coming from Facebook. Installs generated by Facebook remain free indeed, as GetSocial realizes this would be a deal-breaker to most developers. And if one player invites another player who was already active, they become in-game friends but developer is of course not charged anything for this action. As for the chat-system, since this is in essence cloud-based servicing, it follows a different model, where developer is charged monthly $2 per 1,000 MAU as a basis. This rate decreases with scale. Where GetSocial differs from its predecessors is thus in the fact that it doesn't even try to be a social network of gamers. It is a pure Software-as-a-Service model aimed at helping developers and publishers solve their existing issues in a way that is agile, painless, smart and more affordable than tackling this in-house. This angle might prove itself much more adequate for the ecosystem. From what i understand Facebook no longer allows people to 'send invites' to their friends to ask them to join a certain game. How does the Smart Invite feature of GetSocial get around this?